Pangolins are mammals with large scales on their skins which can be found in parts of Africa and Asia. They were often called scaly anteaters in the past. They belong to the order Pholidota which contains a single family, Manidae, and a single genus, Manis, with seven species. Their sizes vary with species, from 30 cm to 100 cm, with females being smaller than males. Pangolins have large, plate-like scales, which are an unusual feature among mammals. They can curl up into a ball when threatened, with their overlapping scales acting as armor. The scales on newborn pangolins are soft but harden as they mature. Pangolins have short legs, with sharp claws which they use for burrowing. Pangolins are specialised insectivores that live almost exclusively on ants and termites. They lack teeth and the ability to chew: instead they tear open ant hills or termite mounds with their powerful front claws and probe deep into them with their very long tongues. Pangolins have an enormous salivary gland in the chest to lubricate the tongue with sticky, ant-catching saliva. Pangolin is eaten as a type of bush meat in parts of Africa. This, coupled with deforestation, has led to a large decrease in the numbers of giant pangolins, and that animal is now an endangered species. 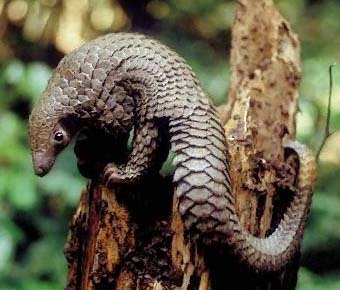 The smaller pangolins are still abundant, however, and the meat tasts similar to duck.